Florian Heilmeyer: What was your very first impression of the Europarei housing development? André Kempe: Our first impression of the residential blocks was shocking. The buildings all seemed at first to be completely without character—the endless exterior corridors with their ugly metal railings; the typical, closed-in ground floor with all those storage rooms; the faceless entrance lobbies with lots of gas and drainage pipes; the elevator shafts that look like they were tacked on. . . . It was clear that architecture had played a very small role in the planning here in recent years. But it turned out that the apartments were very spacious and nice, and that the surroundings were also convincing—in particular the design of the landscape: the trees are large and verdant, just like all those classic modernist drawings one sees. Just like Le Corbusier had promised, so to speak. FH: So it was especially important to retain the qualities of the apartments and the open spaces? AK: Exactly. For the buildings themselves we came up with the motto “A second chance for modernism.” The somewhat naive idea was that everything that had been precluded to economize on the buildings in their day would now be amended. You could say that we wanted to make architecture out of the buildings. The goal was to make them accessible in scale and lend them dignity and a monumental quality within their context. Muck Petzet: What were the biggest problems you encountered? Oliver Thill: It was not until after the competition that the buildings were examined for structural soundness. It quickly became clear that it had been constructed back then to the absolute minimum. It couldn’t withstand any additional loading at all; any additions would have overloaded the structure or necessitated very costly retrofitting of the load-bearing structure. As an example, it was impossible to add floating floor screeds or furred walls to improve the acoustics. They would have been too heavy not only for the walls and floor slabs, but also for the foundations. So in the end, many of the things we had suggested in our competition proposal, such as adding a story above the roof or opening up the ground floor, couldn’t actually be implemented. AK: We also couldn’t create any additional openings because it would have weakened the structure too much. And we weren’t able to replace the balcony slabs, even though all of them were sagging and the drainage was no longer functioning. In order to replace them, we would have also had to replace all the supporting brackets, which would have blown our budget. There were many such problems and discussions. On top of everything else, the apartments were occupied throughout the entire work period. In essence, the job was a participatory process with three thousand residents. FH: Why was there no debate about tearing it down, either partially or completely? AK: Actually, such discussions had already been going on for years. We were even the third team of architects to be commissioned to do the modernization. The two previous concepts failed for this very reason: complete demolition was simply logistically impossible for the housing association. The Europarei was at full occupancy, which means that ten percent of the total population of Uithoorn lives there. There simply would not have been enough alternative housing for all those people. OT: The discussions about razing parts of the complex came up again and again throughout the process. The work of the “rehabilitation machine”—which was well-oiled and working smoothly by then—was even stopped after the sixth of nine buildings was completed in 2010. It was suddenly decided that the three buildings that had not yet been refurbished should be torn down, because they had audited the project and determined—after nine years!—that the whole operation was too expensive. The cooperative was considering building terraced houses instead. But in the end, the economic crisis meant that no concrete steps were taken. MP: Large-scale housing developments have been criticized for a long time now. Their planning approach is considered a failure and the existing housing developments are often seen as problem zones. Is there public debate in general in the Netherlands about tearing them down, or have comparable housing developments already been torn down? OT: Of course. The Netherlands is actually the preeminent country when it comes to demolition and new construction. The Europarei is an exception, simply because it wasn’t logistically possible to tear it down. You could say that its size ensured its continued existence. 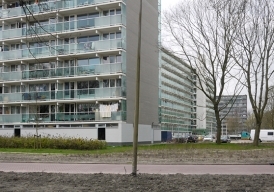 But many similar housing developments are systematically razed or “re-coded”—Osdorp and Bijlmermeer in Amsterdam, Moerwijk in The Hague, Holtenbroek in Zwolle, and many others. In many of those places we’ve put up new construction. That often means following the logic of the old sites and erecting new buildings that are principally similar to the old ones, because it’s not so easy to change the layout of the streets. The biggest change afforded by the new buildings is the area devoted to living. The new housing developments generally have fewer apartments with twice as much space in each, which, in turn, means that on average the number of residents is cut in half. MP: Both of you grew up in East Germany, where industrially manufactured, large-scale housing projects and large-scale mass production were ideologically propagated as a solution to the housing problem and built over vast areas. These days, those Plattenbau housing developments (built with prefab concrete panels) are generally seen as the symbol of a misplaced, monotonous, and inhuman modernism directed solely at optimizing production process. 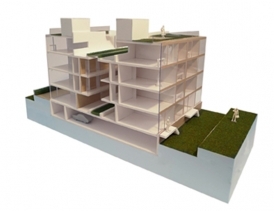 Did your “Plattenbau experience” play a role in the way you approached the development in Uithoorn? AK: There’s no doubt that our childhood in East Germany and the prefab concrete housing found there have left their mark on us. Unlike in West Germany in 1968, East Germany had not experienced any substantial rebellion against the modernism that had degenerated into a bureaucracy. It just continued there, without any significant interruption until 1989. But despite the ugliness of the individual buildings and the flawed urban planning, the logic and consistency of the production process is fascinating and in this sense it represents a quality. Maybe that experience made it possible for us to accept the essence of the Europarei and to develop it further—in other words, we did not negate its modern core, much less deconstruct it, as is done far too often with refurbishment projects elsewhere, but we developed it further. FH: You have repeatedly worked with large-scale housing developments from the postwar modernist era—after the Europarei, your current projects have included ones in Belgium and Germany. How would you characterize your fundamental attitude toward those kinds of housing developments? AK: Basically, we see them critically but with a positive attitude. Large housing developments are part of the failed vision of modernism. But that failure is also a challenge. Positive examples exist not only in the former eastern bloc countries, but also in Geneva or Berlin. 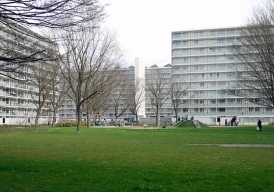 And whether or not those housing developments can be improved or successfully developed further is only partly dependent on the quality of the buildings and their urban structure: other factors are also important, such as urban density, the functional mix, and the proximity and accessibility of mature, “evolved” urban structures such as the old city. Those things are decisive to social aspects, such as a housing development’s image, popularity, the degree of anonymity of its residents, and their sense of belonging to their neighborhood. Looking back at the Europarei, in hindsight we would have tended more toward tearing it down. FH: Why? What would you have rather torn down in retrospect? AK: If we had known from the start how structurally deficient and technically inadequate the buildings were, we might have been more likely to tear them down. At the same time, considering our social responsibility we’re aware that such reasoning is not entirely sufficient. You don’t simply raze 1,100 apartments. 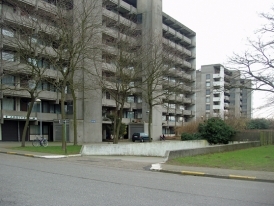 It’s a difficult issue for many of the 1970s-era housing developments in the Netherlands: The cooperatives have limited budgets and the quality of construction is poor. The decision about whether it makes more sense to demolish or renovate must be considered anew each time, on a case-by-case basis. OT: But we still consider the Europarei a success. Even though we could not by far realize everything we had initially intended, we still achieved a level of spatial and architectural quality that enhanced the value of the whole area. In addition to boasting better energy efficiency and modernized systems and equipment, the buildings are now characterized by high-quality, light, and friendly materials. They appear more transparent. The entrances are clearly defined. A very nice moment for us during the project was when we were able to convince the client to replace the ugly balcony railings, since otherwise it would not have been a real “facelift” for the buildings. But if we are ever to do that kind of project again, we would organize the participation of the residents better from the start. MP: So do you feel that it’s important to preserve places like that, above and beyond the need to preserve existing residential space? AK: Of course. Urbanistically, those housing developments are often quite attractive because of their opulent green spaces, even though their size often also makes them part of the overall problem. In addition, wide-scale demolition of such areas is not the best solution in terms of sustainability. Demolition on the scale that is happening in many European countries is without precedent in history and produces an unbelievable amount of refuse, not to mention the loss of the total production energy that these housing stocks contain. OT: The dubious part of these operations lies in an undiminished belief in growth and the continual heightening of norms, regulations, and living preferences, with the result that buildings like those can no longer keep pace with the increasing demands and expectations. That was never the case in pre-modern history. In those days, the existing building was always the starting point for modernization and technological advances, so that this kind of conflict never arose. A non-refurbished block can still be seen in the background. near the motorway (middle and bottom).